I got to the cove to find Dad osprey sitting on one branch to the left of Brother Piper on the right. They both looked at me, checked me out and then ignored me. They sat there for more than 10 minutes. Once in a while Piper would look hard at Dad. Finally Piper got tired of just waiting around and he left. Dad Osprey kept watching life flow by. It was not until Dad Osprey took flight 12 minutes later that I realized he had been standing on a fish! No wonder Piper kept looking hard at Dad. As Dad took flight I heard Broken Feather. She got to the nest as Dad did with the fish. 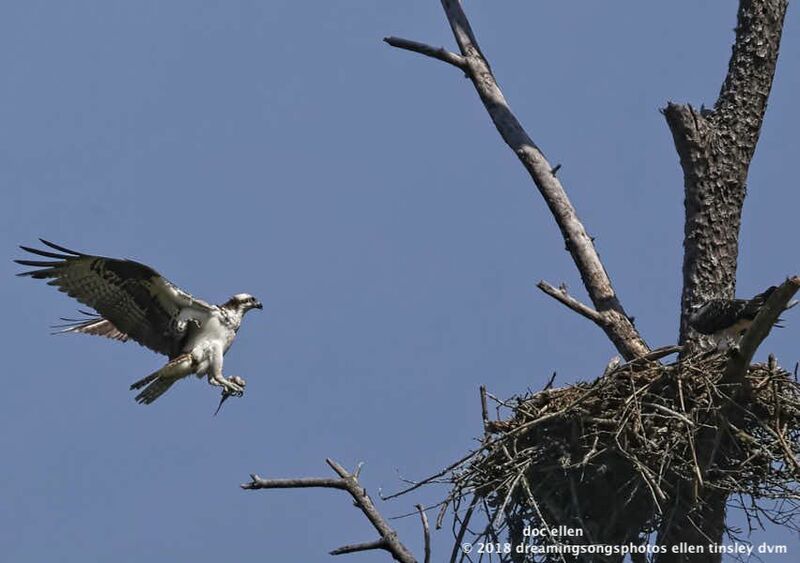 Posted in birds, Jordan Lake, Jordan Lake State Park, ospreys of Jordan Lake, photography, raptors, wild birds and tagged as Broken Feather, Jordan Lake, Jordan Lake State Park, osprey, osprey fledgling, osprey parent, Piper, Ranger Cove.